Once again, Erdogan’s political and territorial ambitions in the geography to the south of Anatolia are eluding his grip. No sooner had Trump announced, in December, his intention to withdraw US forces from Syria than the Turkish president dispatched Foreign Minister Mevlut Cavusoglu, Defense Minister Hulusi Akar, Intelligence Chief Hakan Fidan and his spokesman, Ibrahim Kalin, to Moscow with hopes to fill the void. They came back “emptyhanded” writes noted journalist Nazim Dastan. Erdogan then pinned his hopes on a series of meetings in Washington, planned for this month, to prepare for the US troop withdrawals which Ankara is eagerly awaiting so that it can pounce on the predominantly Kurdish Syrian Democratic Forces (SDF) that Washington has regarded as its main ally in Syria in the fight against the Islamic State (IS) group, but which Ankara alleges is an extension of the Turkish-based PKK. But the whimsical winds blowing from across the Atlantic switched direction, once again, tossing Erdogan another setback in his designs to establish a permanent foothold across the 900-kilometre border with Turkey’s southern neighbour. Instead of the “immediate” withdrawal of some 2,000 American troops that Trump had signalled several weeks ago, the withdrawal now will be “slow and smart”, according to his more recent tweets. 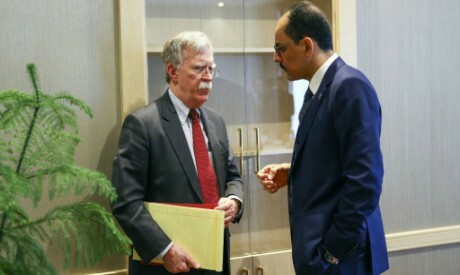 Moreover, only hours before arriving in Ankara, US National Security Adviser John Bolton made it clear that the troop withdrawal would be contingent on Turkish reassurances that “those who have fought with us in Syria, particularly the Kurds” would not be put in jeopardy. He also indicated that the US needed to ensure that measures were in place to protect US forces when they leave. US Secretary of State Mike Pompeo was much blunter when affirming the shift in US policy in Syria. In remarks to the press, he stressed the importance of “ensuring that the Turks don’t slaughter the Kurds” and “the protection of religious minorities there in Syria” during the troop withdrawal. He also refused to give a timeframe for the process, stressing that the US did not want to let its enemies know when exactly US forces would be pulled out of Syria. Pompeo’s remarks came as a below the belt blow to the ruling Justice and Development Party (AKP) who would have read it as a reference to their Ottoman ancestors’ genocidal campaign against the Armenians during World War I. Then came another punch. The Turks should not “undertake military action [in Syria] that’s not fully coordinated with and agreed to by the United States”, Bolton said Sunday, adding that US troops would remain in northeast Syria until Turkey agrees not go after the Kurdish forces. That this edict was issued from Israel sharpened the sting felt in the presidential palace in Ankara. Only a few weeks ago, Erdogan called Netanyahu the “head of a state of terror” to which the latter responded by calling Erdogan a “dictator” and “the occupier of northern Cyprus, whose army massacres women and children in Kurdish villages, inside and outside Turkey”. Bolton also said that Trump wanted to “destroy the [IS] caliphate” and that this would be done in collaboration with the SDF. These forces, the major component of which is the Kurdish People’s Protection Units (YPG), have proven very successful in driving back the terrorist organisation for which reason it has won international sympathy and support for its protection against Turkish military threats. To complicate matters further for the neo-Ottomans in Ankara who, following Trump’s troop withdrawal announcement, had begun a countdown to their march into northern Syria, the Kurds in Syria had already begun to take exigency measures. Most significantly, they moved to conclude a Russian-brokered agreement with the Bashar Al-Assad regime. If it goes into effect, it will reunify the two largest parts of the war-torn country, leaving the northwest, for the time being, in the hands of the Turkish-supported militias opposed to Al-Assad. At the same, the agreement will safeguard the autonomous status of the Kurdish controlled areas in the northeast. True, a similar dialogue last year failed to bear fruit. But much has changed since then and in ways that should encourage both sides to work out an arrangement that will be mutually beneficial and that will simultaneously prevent a direct confrontation which they have so far averted during the long civil war. An agreement between them might also be the last step in sending Erdogan back to square one in his meddling in the Syrian crisis.